Food carts selling gourmet goodies like crème brulee are all the rage in the States. But in the slums of Jakarta, Indonesia, they’ve long been a popular way to eat on the go. Though the streets of Jakarta are awash in cheap eats, the meals are often lacking in nutrition. Mercy Corps Indonesia recently rolled out food carts stocked with healthy food and gussied up pro bono by the ad firm Saatchi & Saatchi in hopes of reaching hundreds of thousands of undernourished kids. That’s where Chris Lin from the Global Entrepreneurship Lab at MIT’s Sloan School of Management comes in. He and three other MBA students went to Jakarta to help Mercy Corps figure out how to make good food cheap (and profitable—these are B-schoolers, after all). Chris is also the first of many humanitarians doing cool work around the globe whom I’ll be interviewing here. I talked to him shortly after his return. Will you give me your elevator pitch for what you were doing? Mercy Corps Indonesia ran a pilot program to address malnutrition in kids and also to hopefully offer some employment opportunities. 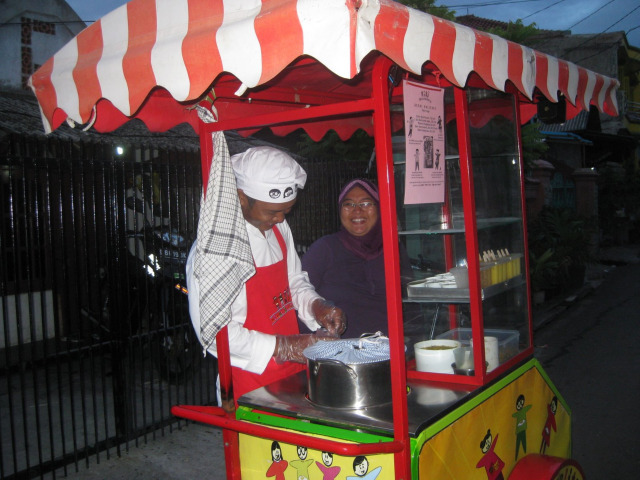 A lot of people in Indonesia eat food from street carts, because they don’t have kitchens and therefore don’t cook. So they found vendors and a nutritionist to make sure their carts offered a well-balanced diet. Does the good street food cost the same as regular street food? We found that the prices were actually pretty comparable—the comparison being instant noodles, which are very popular there, or deep-fried foods. They found four vendors to cook and vend food to mothers to give to their kids, and they’ve run this program for about five to six months. They wanted help to find a business model that would work so that it could be financially self-sustaining. We helped them work through the business structure so that the company they set up would be kind of a franchise system. They will franchise out cooking centers—kitchens, basically—and the kitchens will franchise vendors that they sell food to, and then the vendors will sell food on their own. So there’s multiple levels of independent businesspeople: the corporate headquarters, the cooking centers, and then the vendors. What we went through with them was setting up this structure and then setting up the financials, to show that everyone can make a decent amount of money while still serving healthy food to kids and giving employment opportunities to people. So whoever runs the parent company after Mercy Corps steps out could profit off this venture? Yeah. That was the idea, to demonstrate that there was a viable business opportunity here. We think it should be attractive not just for a philanthropist but also for someone looking to earn some return. —and business charts and PowerPoint slides? That’s how I like to imagine the answers that you guys came up with for this. There were also some intangibles we gave them in terms of more understanding of strategic planning. But the physical thing we gave them was, yeah, an Excel sheet and a PowerPoint deck. Good question, though. I’m still figuring that out. I’ve always been interested in technology, but I’m still very open to exploring different things and different areas. I would love to continue to do global projects, both from a nonprofit and social justice but also from a corporate side. I think there’s a lot of opportunity there in terms of nonprofits helping the business world and the business world helping nonprofits, so would definitely be very open to opportunities like this in the future. In most poor neighborhoods in the United States, we have tons of crappy food. As you think about making healthy food fast, easy, and cheap, do you see applications for this idea in other countries, like ours? That’s a great question. I definitely see that parallel, but it never came up as a topic. I know Kiva is now doing microfinance in the US, after they were able to really successfully do it internationally. So if a businesswoman launched this initiative to try to make cheap street food really hot in poor communities and also make it profitable and wholesome, would you be on the consulting team? [Laughs.] Yeah, I’d definitely love to talk.